WHAT IS THE ‘MOUNTAIN GRASS GLASS GALLERY & SMOKE SHOP’ ORIGIN STORY? Mountain Grass Glass Gallery & Smoke Shop is sort of the culmination of a whole lot of dreams that kind of all fell together at once. We had been looking into buying a business or property in Kimberley for quite a few years - we loved the area and knew we wanted to make our home here, we just needed the right opportunity, which finally came in summer 2017 when we bought 349 Spokane, the old Village Bistro and current home of Creme Cheese Shop. There was a space on the second floor that wasn’t really being used for anything, so we came up with this crazy idea to sell handmade functional glass, partly because one of us spent many years as a glassblower themselves, and partly because with looming cannabis legalization we knew there was no better time to put smoking glass and non-smoking glass in the same place. There is a lot of beauty in handmade objects, especially those that you can use every day, and there are so many talented Canadian glass artists, we wanted to make sure we could share as many as possible! IF YOU COULD ONLY USE 5 WORDS TO DESCRIBE ‘MOUNTAIN GRASS GLASS GALLERY & SMOKE SHOP’ (AND FOR THE SAKE OF THIS QUESTION, LET'S ASSUME YOU CAN ONLY USE 5 WORDS) WHAT WOULD THOSE WORDS BE? We are a small glass gallery and smoke shop - all the glass we carry is handmade in Canada by Canadian artists, makers, and production studios, and we have a small selection of smoking accessories including grinders and rolling papers. We work hard to try to find really unique and well made things that serve a purpose in your life - even if sometimes the purpose is just to be beautiful. We also have worked hard to create a gallery space that is unlike any other you’ve been in. 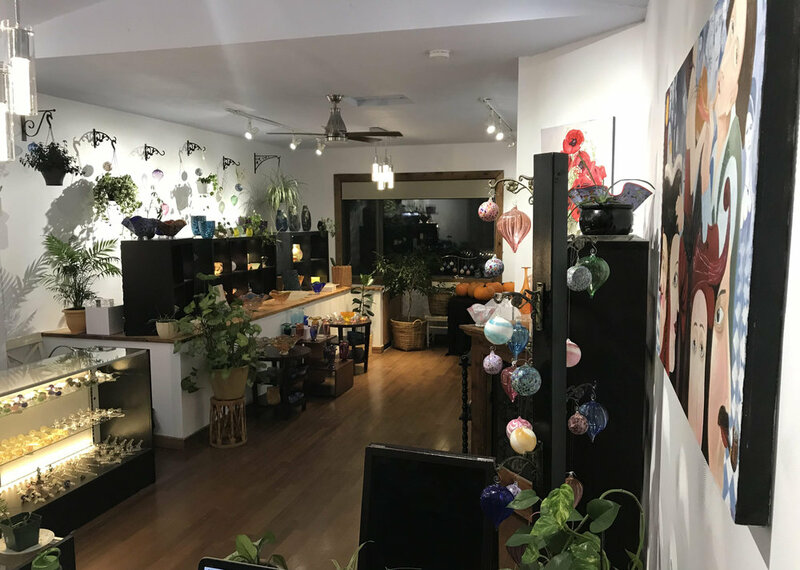 One of our main goals was to ensure that if you were coming in to buy a vase or paperweight, you wouldn’t be turned off by the fact we sold things that qualify as paraphernalia, and if you were coming in to buy paraphernalia it wouldn’t be like any other place you’ve bought it from. Our idea is pretty unique, but so is our location! We are a rare second floor retail location in Kimberley, above the Creme Cheese Shop with a great view of the ski hill! Actually, on 3rd thought… I believe a wise one once said "a picture is worth 1000 words" so how about you share 3-5 pictures (that's like 3000-5000 words) that you think best capture the essence of ‘MOUNTAIN GRASS GLASS GALLERY & SMOKE SHOP’. FINALLY… WHAT IS YOUR FAVOURITE THING/S ABOUT RUNNING something like ‘MOUNTAIN GRASS GLASS GALLERY & SMOKE SHOP’ around Highway 95 eh? We haven’t been open for very long but so far one of our favourite things has been chatting with people who come into the gallery - this area is full of so many warm and friendly people, and it is so interesting to hear what brings people here, and what all these people bring here! And if we had to pick a second thing, it would definitely be the location - we can be in the woods in a matter of a few minutes walk, and we love discovering all the trails and paths we didn’t know existed! ALRIGHT, THAT'S ALL THE Q'S AND A'S FOR THIS Introductions Q&A. Make sure to follow MOUNTAIN GRASS GLASS GALLERY & SMOKE SHOP on the Facebook / InstagraM… and most important of all: make sure you pop upstairs at 349 Spokane Street one day to say “hey”.